AI long ago mastered chess, the Chinese board game Go and even the Rubik’s cube, which it managed to solve in just 0.38 seconds. Now machines have a new game that will allow them to humiliate humans: Jenga, the popular game – and source of melodramatic 1980s commercials – in which players strategically remove pieces from an increasingly unstable tower of 54 blocks, placing each one on top until the entire structure collapses. A newly released video from MIT shows a robot developed by the school’s engineers playing the game with surprising precision. The machine is quipped with a soft-pronged gripper, a force-sensing wrist cuff and an external camera, allowing the robot to perceive the tower’s vulnerabilities the way a human might, according to Alberto Rodriguez, the Walter Henry Gale career development assistant professor in the Department of Mechanical Engineering at MIT. “This is very difficult to simulate, so the robot has to learn in the real world, by interacting with the real Jenga tower,” he added. To become an adept Jenga player, the robot did not require as much practice as you might imagine. 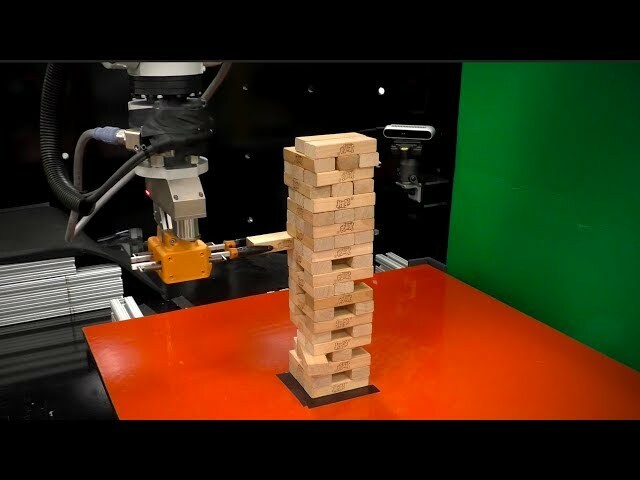 Hoping to avoid reconstructing a Jenga tower thousands of times, researchers developed a method that allowed the robot to be trained on about 300 games. Researchers said the robot has already begun facing off against humans, who remain superior players – for now.